Summary: Kangaroo skin palms provide excellent feel; seem to be well made; have held up well. Can be a bit hot in the summer time; the inside folds of the fabric can rub against the fingers. Can good equipment make you a better rider? I think so — the first time I went for a ride with these gloves, I noticed a real difference. I seemed to have a much better feel for the throttle; I felt that I could ride much more smoothly because I could really tell what each little throttle increment was doing. I also had a much better feel for what the front end of the bike was doing. Now I know why most of the fancy and expensive racing gloves use kangaroo skin on the palm; besides its claimed superiority over cowhide regarding its resistance to abrasion and tearing, it also seems to transmit tons of feel to your hand. I guess it’s because a thinner grade of kangaroo hide can be used to equal the same amount of protection you’d get from cowhide, and less thickness means better feel. Anyway, that’s the very first thing I noticed when I started using these gloves, compared to the cheap old cowhide jobs I was using before. Some of my friends laughed when they heard I paid over $120 for gloves, but my feeling is that they’re worth it for the improvement in feel alone. Whether or not they will protect me in a fall better than anything else, well… who knows? That’s a very interesting question, actually — whenever someone says “these (fill in the blank: helmet, gloves, jacket, etc.) are the best because I fell off and I walked away” — the question is “compared to what?” Maybe if you were wearing el cheapo brand “X”, the outcome would have still been the same. Until someone volunteers to scientifically crash test (?!) products for our benefit, we won’t know. So I postulate that as long as you buy decent quality gear at a price you feel comfortable with, you’ll probably end up in as good a shape as the next rider with the more expensive gear. By the way, a corollary is “anything is 100% better than nothing”; an old pair of garden gloves, while certainly not the ideal solution, is probably better than wearing nothing! Anyway, back to the gloves; they’re nice and comfortable, the size large fits each finger perfectly (unlike other brands of gloves I’ve tried), and they have a nice gauntlet that fits over all of my jackets, including the Aerostich Darien, which has a lot of material at the wrist that can be pretty hard to stuff under a glove. There are two closures, one big wide hook-and-loop (we’re not allowed to say Velcro….ooops!) that closes the gauntlet, and another, smaller hook-and-loop that closes over the top of the wrist (see photos above). They have the cool (or ugly, depending upon your point of view) carbon fiber knuckle guards and some extra padding on the palms and along the pinky finger. There’s also some extra kangaroo hide that runs down along the index finger and up the thumb; I guess this is to help improve wear in that area that gets the most pressure. There seem to be two schools of thought on glove seams; external and internal. Some gloves have external seams and with other brands, including these, the seams are internal. I’m not sure if one is better than the other, but the external seamed gloves always seem to look untidy to me, and the stitching and the edges of the leather always seems to quickly fray. The Violators are internally seamed, but the downside is that you can feel some of the seams rubbing against your fingers. About the only place this sort of bothers me is on the tip of my index and second finger. I can feel the seams, and they sometimes get caught right under my fingernails as I twist the throttle. It’s not really a nuisance, it just sometimes takes a bit of your concentration away because you can feel it catching under your nails. My fingertips come right up to the end of the gloves, so maybe they will fit you differently and you won’t have this problem. It’s not a big deal, and I guess I’m really reaching to find something I don’t like about them. Oh yes — they can also be a bit hot in the summer, but I guess any glove of this type would be. One other thing — they’ve stretched just a tiny bit, but they seem to be wearing very well after about 5,000 miles. They are very comfortable and felt great right from the start, and I haven’t noticed any difference over time. The Violator gloves have been enormously popular sellers, and this year Teknic wants to keep up the momentum by improving them and lowering the list price. When I bought mine in 2001, the list price was $149.99, I got them for what at the time was a good deal at $119.99, but I’ve seen them since for as low as $99.99. If you see them at that price or lower, definitely grab them, as I think it would be a steal. Kevlar layers in palm, little finger and thumb, increases abrasion and heat resistance. If you’re in the market for a nice set of race-style gloves, but don’t want to pay a fortune, check out the Violators — I think you’ll agree they’re well worth the money. From “R.L.” (5/10): “First, I’d like to mention that I’ve recently been turned on to your site, and I have found the reviews and user comments to be incredibly helpful. I want to offer a heartfelt thanks for the site and the reviews. I followed the link to the Teknic Violator glove review from the Racer High End glove review. 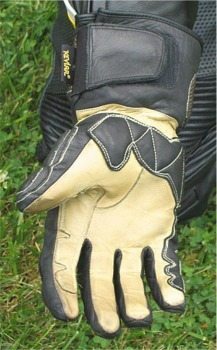 I was recently in the market for some new gloves, and the Racer High End gloves were recommended. I headed over to your site and was quite pleased to find a review. That’s when I saw the link to the Teknic Violator glove review. I finished off the Racer High End page, then followed the link over to the Teknic review, where I must say that I was in complete agreement with your assessment. I’m in the market for some new gloves because I took a nice spill in my Teknic Violator gloves and came out without a scratch. The gloves held up amazingly well, even after 15,000+ miles and several years of use. I think I’ve had that pair of gloves since 2003 or 2004, and they’ve been through two crashes. The second slide is what did them in for good, I’m sorry to say. Here’s a pic of the after damage. You can clearly see the abrasions on the palms, in some places going quite deep into the leather. My skin came out of those gloves completely intact. I’ll never have anything bad to say about those gloves. Two crashes and they still protected my hands completely. 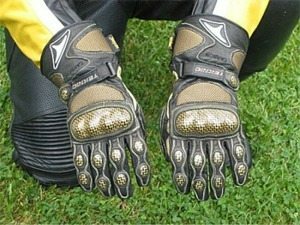 I’ve owned several pairs of gloves and the Violators held up even better than a much more expensive pair of Alpinestars GP Plus gloves.